This is the end of the thirty sixth chapter Of the book of Aranya (Forest) of the holy Ramayana composed by Valmiki as the first epic. This is the end of the thirty seventh chapter Of the book of Aranya (Forest) of the holy Ramayana composed by Valmiki as the first epic. 38.Mareecha Tells about his interaction with Rama . This is the end of the thirty eighth chapter Of the book of Aranya (Forest) of the holy Ramayana composed by Valmiki as the first epic. 39.Mareecha tells about a recent encounter with Rama. This is the end of the thirty ninth chapter Of the book of Aranya (Forest) of the holy Ramayana composed by Valmiki as the first epic. This is the end of the fortieth chapter Of the book of Aranya (Forest) of the holy Ramayana composed by Valmiki as the first epic. This is the end of the forty first chapter Of the book of Aranya (Forest) of the holy Ramayana composed by Valmiki as the first epic. This is the end of the forty second chapter Of the book of Aranya (Forest) of the holy Ramayana composed by Valmiki as the first epic. “Oh Intelligent Lakshmana, you take care of Mythili , doubting that danger would come from all directions at all times and also the king of birds would go round the hermitage protecting her. This is the end of the forty third chapter Of the book of Aranya (Forest) of the holy Ramayana composed by Valmiki as the first epic. Then Rama killed another deer , collected its meat and departed very quickly towards Janasthana . This is the end of the forty fourth chapter Of the book of Aranya (Forest) of the holy Ramayana composed by Valmiki as the first epic. This is the end of the forty fifth chapter Of the book of Aranya (Forest) of the holy Ramayana composed by Valmiki as the first epic. The trees of Janasthana seeing him of greatly fierce actions started shaking and wind ceased to blow. The wicked Rakshasa with a cruel mind seeing that auspicious lady who had pretty lips and teeth , who was resembling a full moon, who was sitting in her hermitage affected by sorrow and tears , who was having eyes like lotus leaf like eyes and who was dressed in yellow silk cloth went near her. This is the end of the forty sixth chapter Of the book of Aranya (Forest) of the holy Ramayana composed by Valmiki as the first epic. This is the end of the forty seventh chapter Of the book of Aranya (Forest) of the holy Ramayana composed by Valmiki as the first epic. This is the end of the forty eighth chapter Of the book of Aranya (Forest) of the holy Ramayana composed by Valmiki as the first epic. With very red eyes, decorated with pure gold ornaments , desperate with anger , resembling a black rich cloud , with ten heads and armed with bows and arrows, Ravana the Rakshasa stood before her. The king of Rakshasas Ravana , discarding the form of a mendicant , assumed his own form and stood with a huge body, dressed in reddish attire, observing the gem of the woman stood before her. This is the end of the forty ninth chapter Of the book of Aranya (Forest) of the holy Ramayana composed by Valmiki as the first epic. Jatayu who was resting on the tree heard that sound and Saw quickly Ravana as also Sita also. This is the end of the fiftieth chapter Of the book of Aranya (Forest) of the holy Ramayana composed by Valmiki as the first epic. The king of vultures who had great luster seeing the happy Ravana going away with the daughter of Janaka in his custody , flying up chased Ravana and after chasing him , he obstructed him and told. Then out of great anger Ravana threw away Sita and hit the vulture king with all his hands and feet. This is the end of the fifty first chapter Of the book of Aranya (Forest) of the holy Ramayana composed by Valmiki as the first epic. Those great sages who lived in Dandakaranya forest though they were all pained by it, felt happy at seeing Sita being grasped because they could see in it casually the destruction of Ravana. Sita ’s was beautiful with pretty forehead and beautiful hair looked by the inner side of a lotus flower without any marks and her flawless white nice shining teeth which was decorated, her nice nose , her lovely red lips . She was constantly weeping and wiping away her tears and her pure face looked like a moon and being held by Ravana it looked like a moon trying to break out from the blue cloud. 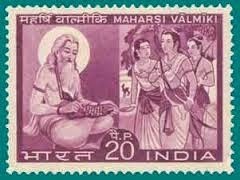 This is the end of the fifty second chapter Of the book of Aranya (Forest) of the holy Ramayana composed by Valmiki as the first epic. This is the end of the fifty third chapter Of the book of Aranya (Forest) of the holy Ramayana composed by Valmiki as the first epic. This is the end of the fifty fourth chapter Of the book of Aranya (Forest) of the holy Ramayana composed by Valmiki as the first epic. This is the end of the fifty fifth chapter Of the book of Aranya (Forest) of the holy Ramayana composed by Valmiki as the first epic. This is the end of the fifty sixth chapter Of the book of Aranya (Forest) of the holy Ramayana composed by Valmiki as the first epic.